© 2011 KOP_NV. All rights reserved. 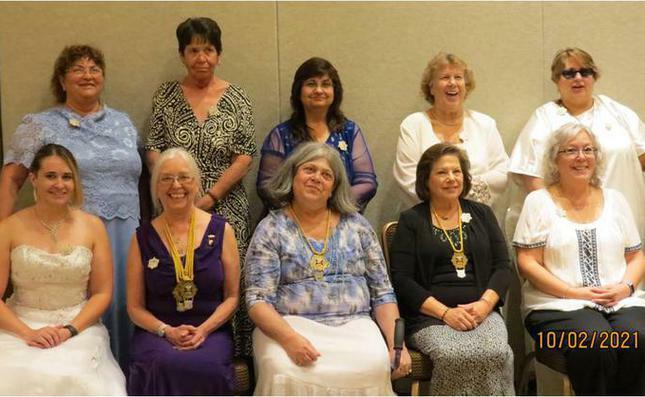 The Order of Pythian Sisters, the independent auxiliary of the Knights of Pythias was organized at Warsaw, Indiana on October 22-23, 1888 by a dedicated Knight, Joseph Addison Hill, of Greencastle, Indiana. Mr. Hill was a well educated man. He was a man of ideas and of thought, a student of books and an observer of life who loved his fellow man. Mr. Hill prepared the ritualistic forms, the ceremonies and emblems of our Order. The color combinations are arranged according to the strict law of optics which make a complete prism as arranged around the room. He conceived the idea and inspiration for our Order's colors when a raindrop fell upon the window ledge. Looking up from the raindrop, Mr. Hill beheld the beautiful rainbow and in it, he saw our colors: White, representing Purity; Red, for Love; Equality represented by Yellow, and Blue, symbolic of Fidelity. These principles are the foundation stones on which the Pythian Sisters have built their Temples. Purity is the stage reached through honorable motive, action and thought and should be a goal we seek to attain. Love represents service, guidance, trust and tolerance. Through Love we are bound together as a band of Sisters. Equality requires sharing with each Sister all rights and responsibilites. As Pythian Sisters we work together for the good of all. Fidelity means being faithful, steadfast and loyal to God and to each other. These principles provide a pattern for a good and meaningful way of life, the aim and object of all Pythian Sisters.